Rosenbalm Aviation Inc, Medford, OR, 1963-1972. 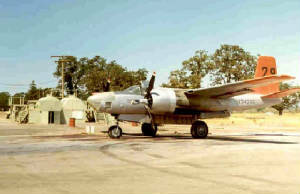 - Flew as tanker #F29 (later #29). William Dempsay/Central Air Service, East Wenatchee, WA, 1972-1981. - Flew as tanker #108. Kinney Air Tankers, Richey, MT, June 1981. - Damaged after left main gear collapsed during landing, Dubois, PA, June 2, 1982. Custom Farm Service of Montana, Richey, MT, 1984. William Dempsay/Central Air Service, East Wenatchee, WA & Rantoul, KS, July 5, 1985-2002. - Stored in open, Rantoul , KS, 1985-2001. THE AIRCRAFT WAS BEING FERRIED TO ITS HOME BASE IN MONTANA. DURING A LANDING TO REFUEL, THE LEFT MAIN GEAR COLLAPSED AFTER THE AIRCRAFT HAD ROLLED ABOUT 2500 FT AND HAD SLOWED TO ABOUT 30 TO 40 KTS. AN INSPECTION REVEALED THAT THE LEFT MAIN GEAR BEAM MOUNTING AXLE HAD SHIFTED OUTBOARD ABOUT THREE INCHES. THE REASON FOR THE SHIFT WAS NOT VERIFIED.